The band was a combination of the K Division band (Alberta), the F Div. band (Sask) and me from the E Div. band (BC). The band was 15 pipers, four sides, one tenor and one bass, and two Drum Majors. 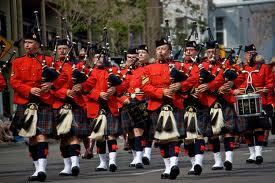 The Pipe Sgt for this parade was Brent Blanchard, the Pipe Major from the F Div. band. There were two troops of Red Serge members, 70 in all, along with Asst. Commissioner Peter German, and Asst. Commissioner Dale McGowan. The RCMP was well represented throughout the parade in various historical entries. There were a few hundred horses throughout the parade, so trying to side step “road apples” was a lost cause. The parade was very well attended, with reports of over 400,000 spectators, as the Royals, Kate and William, were in attendance. Passing the reviewing stand we played the RCMP Regimental March/ Maple Leaf Forever at an up tempo of 105 to 107 steps. The RCMP Regimental March/Maple Leaf Forever was played about every third set, so came up often. The parade started at 8:55am; we were #18 and stepped off about 9:15. We finished at 11:05 and it was solid playing with very few breaks for the entire parade route of well over a mile or so. We actually finished the route about a half hour before the final entry stepped off. The weather wasn’t hot, about 20 degrees, but there was a wind. The bass drum was blown around several times causing me to quickly reset my feet for balance more than once as I marched. The K Div. mess sponsored a burger lunch after the parade before the Regina crew headed East and the Edmonton crew north. It was a good group to play along with and both ‘K’ and ‘F’ bands are composed of great folks who enjoy playing parades on a regular base and do so around their respective provinces. 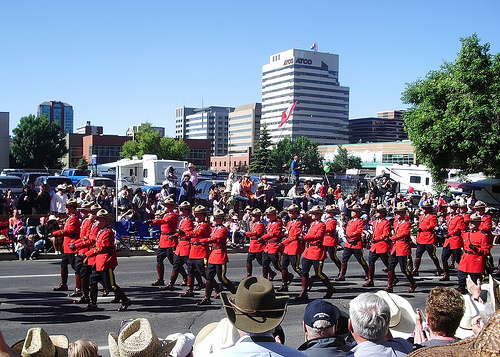 2012 is the 100th anniversary for the Calgary Stampede so I suspect the parade will be bigger and organizers will want another strong showing from the RCMP. If anyone wants to play a long, but very rewarding, parade with some really good, down to earth people, I would recommend the Calgary Stampede parade in association with the K and F Div. bands. It’s worth the effort and time.